Perry and Son’s - Family owned and operated since 1925. 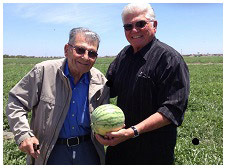 We are one of the largest shippers and handlers of seedless and regular watermelons, pumpkins and a variety of hardshell squash in California. We strive to provide our customers with the best quality of produce on a year round basis. We treat our customers like "family", because that is how we feel about them!